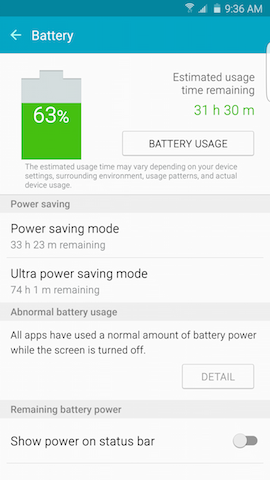 Your device has an application that lets you see which applications and features use the most battery power. 3. 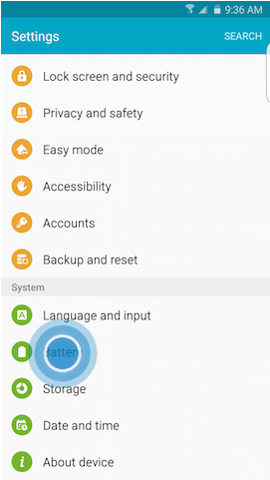 Scroll to and touch Battery under the System tab. 4. The Battery status displays the percentage of battery power remaining and how long you might expect that power to last. 5. 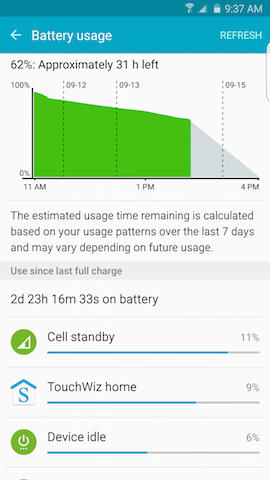 Touch BATTERY USAGE to see which processes were running since your device was last fully charged. 6. Touch the name of a process or application to see its Use details. • Touch FORCE STOP to close the application. 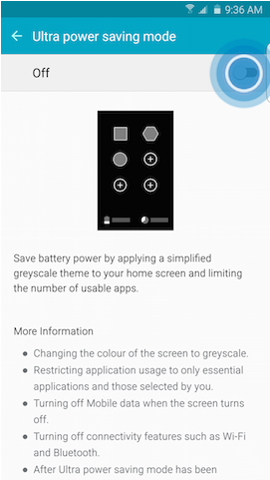 • Touch REPORT to submit feedback about the application's battery usage to Google™. • Touch APP INFO to view its application information screen. • Turn off the Bluetooth® feature. • Turn off the GPS service. • Turn off the mobile data connection. • Turn off auto-syncing of accounts. • Turn off the Smart features. • Discontinue use of Live wallpapers. • Decrease the backlight time (timeout settings). • Decrease the brightness of the display, or use Automatic brightness. • Verify that you are using the Samsung USB/charging cable and wall charger included with your device, and not third-party accessories. • Charge using a wall outlet, not a computer, for best results. 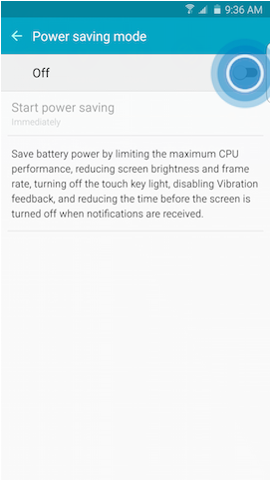 Power saving mode conserves battery power by limiting CPU performance, reducing screen brightness, and turning off the touch key light and vibration feedback. You can turn on Power saving mode manually, or set your device to go into Power saving mode automatically. 4. Touch Power saving mode. 5. Touch the slider to turn Power saving mode on . 6. Touch Start power saving and choose when you want Power saving mode to take effect. *Based on laboratory testing. 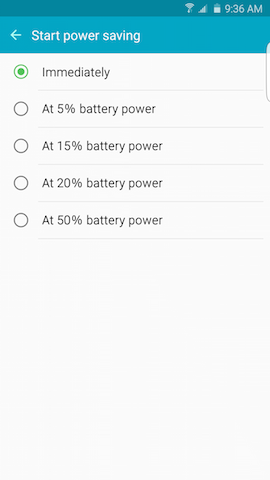 Battery power consumption depends on factors such as network configuration, wireless service provider, signal strength, operating temperature, features selected, vibrate mode, backlight settings, browser use, frequency of calls, and voice, data, and applications' usage patterns. 4. Touch Ultra power saving mode. 5. Touch the slider to turn Ultra power saving mode on . 6. Review the terms and conditions, mark the checkbox, and touch AGREE. 7. The Phone, Messages, and Internet applications are automatically available in Ultra power saving mode. Touch to make up to three more applications available. 1. From the Home screen, touch MORE. 2. 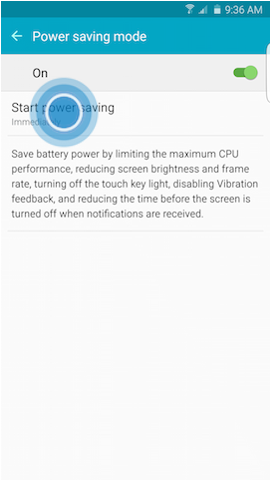 Touch Turn off Ultra power saving mode. 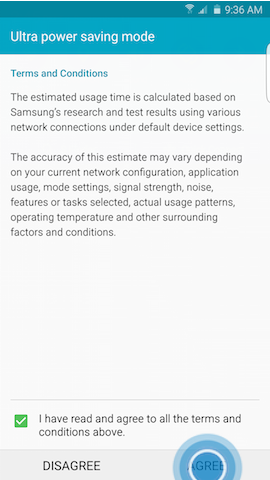 Note: To adjust network connections, sound, and display settings in Ultra power saving mode, touch MORE > Settings. 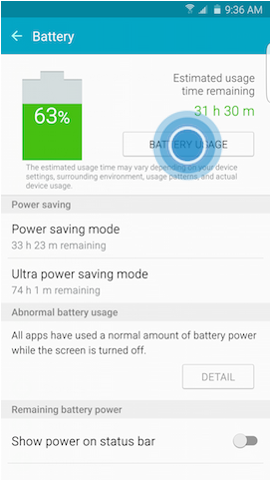 Galaxy S6 Edge+: How do I charge my Samsung Galaxy S6 Edge+ fast? 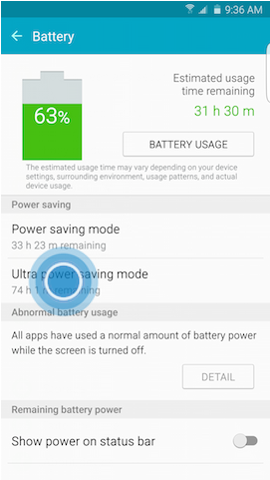 Galaxy S6 edge+: How do I charge my Samsung Galaxy S6 edge+ wirelessly? 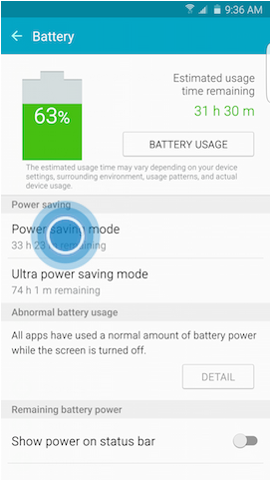 Galaxy S6 edge+: How do I configure the power saving modes on my Samsung Galaxy S6 edge+?